Computers in Libraries is a must-attend event that caters to all interests and all levels of knowledge. 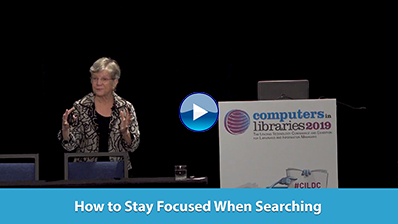 This year’s conference theme, Strategic Focus & Value for Library Communities, encompasses all the challenges, solutions, technologies, and practices that those working with computers in libraries or libraries in computers are dealing with today. Don’t miss it! Register today! On Monday, Feb. 7, AOL announced the acquisition of The Huffington Post (Huff Post) for a reported $315 million. AOL's CEO, Tim Armstrong, proclaimed that "Together, our companies will embrace the digital future and become a digital destination that delivers unmatched experiences for both consumers and advertisers." The acquisition is intended to "create a premier global, national, local, and hyper-local content group for the digital age—leveraged across online, mobile, tablet, and video platforms." Wall Street analysts seem to feel this diversification by AOL into the news business represents not only a good fit between the companies but also an aid in attracting more big brand advertisers to the company. Owners of ebook readers have been known to complain about restrictions on sharing their electronic books. Until recently, neither the publishers nor the retailers supported or encouraged it. On Dec. 30, 2010, Amazon announced the Kindle Lending Club, following in the footsteps of Barnes & Noble's LendMe feature for the nook. Enter eBookFling from BookSwim. BookSwim positions itself as "America's only Netflix-style book rental service." The eBookFling offering, which was announced on Jan. 25, will serve as a "virtual ebook swap website." Scientific videos for R&D from the Department of Energy (DOE) are now searchable through Science Cinema. Jeffrey Salmon, deputy director for resource management with the DOE Office of Science, said, "Video, animation, visualization, and other forms of multimedia are now widely used to record, share, and collaborate in science. Because of the U.S. Department of Energy's central role in science, we are also at the center of technology for collecting and disseminating this new media. ScienceCinema's pioneering search and retrieval capability provides the public with a way to quickly access and view our multimedia-based R&D information." Paratext will integrate thousands of links to more than 125 major reference works on Wiley Online Library. Launched last summer, the Wiley Online Library carries content published by Wiley-Blackwell, including Wiley-VCH. Eileen Dolan, director of market development at Wiley-Blackwell, said, "This new partnership will ensure that award-winning reference titles such as Kirk-Othmer Encyclopedia of Chemical Engineering, Ullmann's Encyclopedia of Industrial Chemistry, and the Encyclopedia of Life Sciences are even more discoverable." USA TODAY launched the use of Microsoft Tags in the newspaper. The newspaper will feature at least one Tag in each print section daily. Readers can scan the Tag with their mobile devices for direct access to videos and online content. The Tags will provide readers with access to daily photo galleries and the latest financial news and sports scores, as well as other video and digital features.